Victorian Home Downtown Blocks from Waterfront, Shops, Cafes. You feel as though you are stepping into another era when you walk through the door - except for for all the modern conveniences. Originally built in 1908, with soaring ceilings, beautiful moldings, original hardwood floors, this home is reminiscent of the past, while completely modern and appointed with upscale furnishings and contemporary appliances. Located near the center of town on a quiet street in a lovely, friendly neighborhood. Walk to the coffee shop, grocery store, downtown area! Enjoy sitting outside on lovely summer days on the large fenced in patio appointed with table, chairs, umbrella. Cook up a feast on the propane grill and enjoy dining 'al fresco'! The three generously sized bedrooms have queen beds and are handsomely appointed. Open, cheery kitchen with all the cookware and utensils you require. Plenty of parking. Upstairs master has a beautiful mountain view and balcony. The other upstairs bedroom has a peek-a-boo view of the Strait. Bedroom on first level is perfect for those who have difficulty with stairs. I pride myself on providing a lovely, comfortable, aesthetically pleasing, immaculately clean home where guests can enjoy their much deserved vacations. If there is anything that needs to be attended to during your stay, or if you would rate the home any less than 5 out of 5 stars - contact me immediately and I will attend to any issues. I have managed and owned bed and breakfast accommodations and vacation rentals for 25 years. It is always my goal to provide guests with the best experience possible - exceeding expectations and providing 'little extras'. Please don't hesitate to e-mail me with any questions you might have regarding this rental. I look forward to hosting you!! I was born and raised in Alaska. When my father retired here in Port Angeles I frequently came to visit. I fell in love with Port Angeles (and grew weary of the long, cold Alaska winters!). I also fell in love with this home. I love the small town nature of Port Angeles, being close to the water, hiking trails, and the friendly people here. Port Angeles appealed to me due to the friendly, quiet, peaceful nature of the town and surrounding area. Life seems to slow down here. The town is quaint, the setting gorgeous, with lots of activities to enjoy. After looking at homes for almost a year, I chose this one - for it's location, for the fact that it was an older home with so much charm, because it had three bedrooms each which had its own appeal, because it had 1.5 baths (many of the older homes here have three bedrooms and one bath), and it was on a quiet street with homes that showed pride of ownership. I love the 'feel' of this old home, while enjoying the modern amenities. The neighbors are friendly; we wave and greet each other everyday. I love being able to walk to my gym, the store, downtown, the marina, the farmer's market, and to various events held in town. Never having lived within city limits, it's nice to be close to all it has to offer. Shortly after purchasing the home, I had a beautiful fence installed around the patio. Now the patio feels like an extension of the house and it's my favorite place to be on nice days. toilet, Upstairs. Half bath with toilet and sink. Bathrooms are modernly appointed. This Victorian home was built in 1908 - I was very pleased to find a home of this quality with a half bath. Many of the older homes here have one bath. Home is in a quiet neighborhood just blocks from downtown. Distant view from upstairs bedroom. It's not often needed here though! Heat pump downstairs, each bedroom has individual heating units. Electric fireplace in dining room. Oh yes! More than you will need. Yep - and it has a turntable! Basic coffee maker, coffee grinder too! Stainless steel with a blue indicator light! Some common use items are supplied - plastic wrap, variety of spices, garbage bags, start up toilet paper and paper towels, cleaning supplies. Good sized kitchen, fully appointed with extensive cookware. Nice sized dining room adjoining living room and kitchen. A selection of CDs is provided. A variety of DVD movies. Off master bedroom. Looks out toward mountains. Patio with deck furniture with privacy fence off kitchen. There are stairs leading into the house: 5-8 depending on which entrance you use. Built in 1908 this home has the charm of a bygone era, yet all the modern conveniences. Recently fully remodeled and all newer appliances. Patio with privacy fence, table, chairs, umbrella - for enjoying time outdoors. Lovely neighborhood in walking distance to downtown Port Angeles. Convenient parking in garage in driveway. We really enjoyed our stay here. We had a total of 5 adults and one kid, the house was great for our group. It only has one full bathroom but that is typical for the houses in that timeframe and area, and in fact it had an extra half bath that was a bonus. Plenty of hot water for showers, great patio for sitting out, private parking and the house has been remodel and is nicely decorated. We often run in to places that have terrible beds, and that’s a problem for my husband who has a bad back. Beds here were very comfortable with nice quality linens. We really enjoyed having the big dining table for playing games, nice kitchen with everything we needed and had a chance to relax and watch a movie. Our family comes in from different states and will meet up for family vacations and we love finding places just like this. Check in was very easy with a coded door entry. Thanks for the great experience in Port Angeles! This was a great place to break up our holiday in between Seattle and Victoria. Port Angeles is a quiet little town but had what we needed to access the activities we wanted to do on the Olympic Pennisula. We really enjoyed our stay in Port Angeles thanks to a perfectly provisioned house and a welcoming owner. The basket of farm fresh eggs in the fridge were just the start of a lovely stay. Few other VRBO houses in our experience have been as well-stocked with knives, pans, pots, condiments, and so many other neccessities. It is clear that the owner has her guests' needs and comfort in mind. 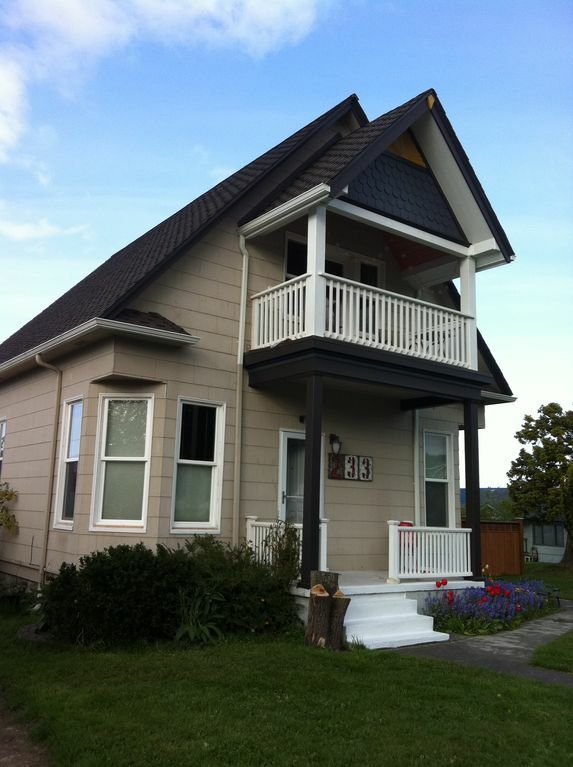 We highly recommend this house to visitors to Port Angeles! The home was spotless and the best appointed kitchen in any vacation rental we've ever stayed in. The property is located in a great area, close to town, yet in a quiet neighborhood. We loved our stay and would love to return! We were looking for a home base to take the ferry to Victoria one day and explore the national park the others. Port Angeles is not a tourist town, per se, but it is central and there are some good restaurants (Bella Italia and Front Street Gastropub). The owner of this home was hospitable and helpful. The house had everything we needed. We were travelling with an older couple and were particularly pleased that there was a first floor bedroom for them. Wow, just amazing. Such a beautiful and charming house. Perfect location. We felt so lucky to find this place. I honestly can't put into words how charming the house is. The owner Janelle was easy going and professional. We absolutely LOVED staying here. Character and Charm. Central location, close to city amenities, easy access to Olympic National Park and Hurricane Ridge. A rental agreement is attached to my listing. Booking the property indicates that guests agree to the terms of the rental agreement. If you are bringing a dog please specify the breed and read the pet agreement. Longer bookings require a higher security and pet deposit. Inquire for terms specific to your needs.